Worship is one of the fastest growing genres in all of music. 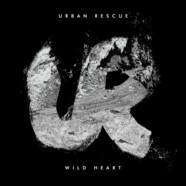 With artists like Chris Tomlin, Hillsong United, Rend Collective, Matt Redman, Crowder and projects like Passion, the world of worship is a vast and deep one that just got even more so with the edition of Urban Rescue. They’re the first band to sign with Rend Family Records and their latest release- Wild Heart EP is a powerful one from the title to the lyrics to the music. The title has a deep theme in itself and then, when you get past that, the music speaks volumes. Working very closely with Rend Collective lately, the music on Wild Heart shows that, with some of the songs featuring a very folksy-CCM feel and others having a bit of an electronic feel but not going overboard an either sound. “Kaleidoscope” is poetic and beautiful and gives life to the EP while “His Name” is one of the most beautiful and inspirational tracks in CCM so far this year. If “Kaleidoscope give Wild Heart breathe, “His Name,” is the heartbeat and the life of the EP. This is the standout track of Urban Rescue’s career. There’s something to be said about how powerful, encouraging and exalting Wild Heart is. If this is a sign of what’s to come from Urban Rescue, it’s clear that it’s going to be a fun, powerful and spiritually-empowering ride.